In 1836, two bars for captains were established and one bar for the first lieutenants. The specific color of the bars were either gold or silver depending on the color of the border of the shoulder straps which were also adopted in 1836. The border of the shoulder straps was of gold or silver, according to the branch of service. In 1851, the silver border used by infantry was abolished and all borders became gold. The insignia for captains and lieutenants remained gold, except there was no insignia for second lieutenants and none was worn on the shoulder strap. In 1872 epaulettes were abolished and shoulder knots substituted. In the same year, bars of captains and lieutenants changed from gold to silver to correspond with insignia of seniors. Second lieutenants continued to have no insignia until a gold bar was adopted in December 1917. 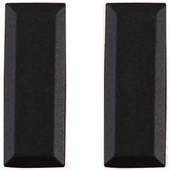 Our Regulation 1st Lieutenant Officer Rank Insignia Subdued is a black plated metal badge. Rank Insignia sold in pairs. This is the same badge that is supplied to the U.S. Military and sold in the U.S. Military Base Exchanges.